This book was originally published in 1855. 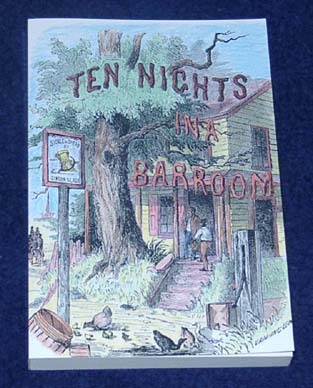 The "ten nights" referred to in the title are scattered over a period of several years. During those years, the narrator takes the reader from the first meeting with the owner of a newly opened tavern. The introductory chapter bodes evil when we learn that the tavern owner had recently sold his very profitable mill in order to make, as he envisioned, more money with less effort as a tavern owner. As you might guess, the tavern owners association with the spirits he provides in the bar of the tavern serve to intoxicate the patrons to ruin as well as, when the owner begins to imbibe, ruining his family as well. As was stated in the listing of titles, this is one of the classics of American temperance literature. In order to have a knowledge of the social context of the time period, every historical interpreter should read this book.